What an incredibly wet couple of weeks we've had here in the Tampa Bay area. Historic rainfall has made it extremely challenging to be out on the water, but fortunately, we were able to slip out whenever possible, dodge a few pesky storms and made some more great memories!! 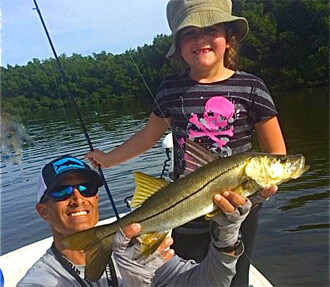 The summertime snook bite continues solid with some quality fish being caught. The redfish which had been sparse have finally started becoming more abundant on the flats. Most of the fish we are finding are in the slot range. This has meant many anglers would only need to catch a spotted seatrout to complete what is called an "Inshore Slam" by catching all three of these species in a single day. The trout have been hanging in the deeper grass and although not usually very big this time of year, there are plenty of them providing for this unique opportunity. The bridges are holding an abundance of tasty mangrove snapper which have been feasting on the small sardines and the hard fighting "big uglies", the black drum, which can't resist a cut blue crab. The tarpon have moved up into the bay and are in their summer spots. There are fish of all sizes mixed in. Most of the ones we've been jumping are in the 30 - 60lb range but there are some monsters among them! You never know what size fish will be erupting into the air. There's also still plenty of jacks and our small summertime sharks cruising around as well. So it looks like the rain has finally stopped, and the sun is out…finally! Thank goodness because I have a busy schedule coming up. 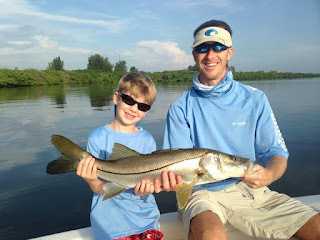 Still got some good fishing days available this month, so if you want to get your kids out before school starts, give me a call. Also, this Saturday, August 8th, I'll be at Dicks Sporting Goods at the Westshore Mall in Tampa from 11 - 5pm. So, if you want to talk fishing or learn how to throw a castnet... come on down! Great deals to be had too! !